Quenchers are substances capable of absorbing energy from a fluorophore (such as a fluorescent dye) and re-emitting much of that energy as either heat (in the case of dark quenchers) or visible light (in the case of fluorescent quenchers). Dabcyl is an example of a dark quencher, and TAMRA is an example of a fluorescent quencher. When the fluorophore and quencher are in close proximity, the quencher absorbs the energy emitted from an excited fluorophore, thereby suppressing its emission. When the two substances are widely separated, the quencher no longer can absorb the fluorophore�s emission, and the latter�s presence can be visually detected (1). These properties are utilized in many popular oligonucleotide probes currently used for research or diagnostic purposes, such as TaqMan or Molecular Beacon probes (2-3). 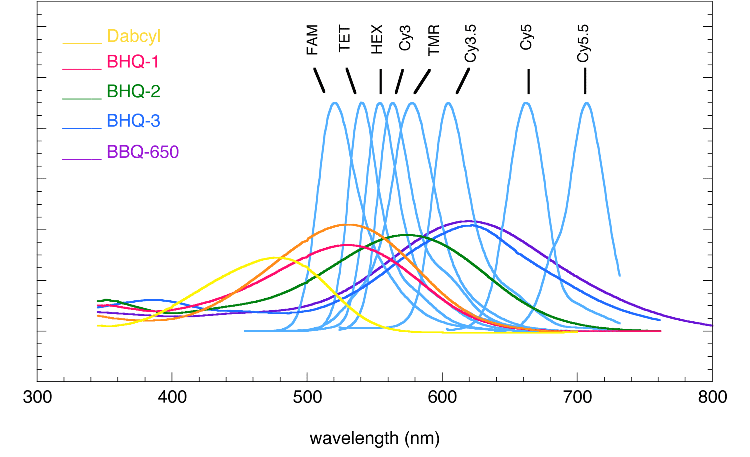 In such probes, a quencher and fluorophore having overlapping absorption and emission spectra, respectively, are incorporated into the probe as a pair. The probe is designed such that the quencher and fluorophore will always remain in close proximity if the specific target is not present, and be widely separated if it is present. Observation of a fluorescent signal thus indicates presence of target, and lack of a fluorescent signal indicates absence of target. "Black Hole Quencher", "BHQ-1", "BHQ-2" and "BHQ-3" are registered trademarks of Biosearch Technologies, Inc., Novato, CA.